The Reactor Oversight Process (ROP), which the Nuclear Regulatory Commission (NRC) instituted to evaluate the safety and security performance of the nation’s 104 nuclear power reactors, recently passed the ten-year mark. The ROP was set up to detect safety problems and mandate closer oversight of problem plants so the NRC could ensure that plant owners restored safety levels quickly. 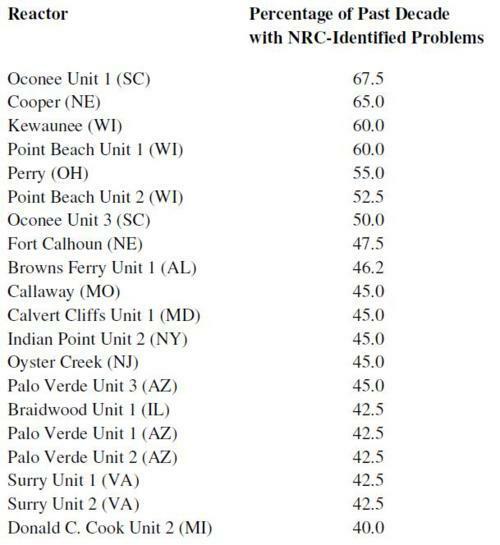 Unfortunately, a UCS review of the ROP’s first decade shows that it needs to do a better job, since 7 reactors operated with known safety shortfalls for at least half of the past decade, and 13 others operated with NRC-identified performance problems for at least 4 of the last 10 years, as shown in the table below.